Want to try something unique and adventurous? Then this road trip from Guwahati to Tawang is the one for you. Of course this trip is for the folks who enjoy exploring. There are few things to know before opting for this journey. The Inner Line Permit (ILP) has to be obtained by everyone (Indians and Foreigners) who enter Arunachal Pradesh. You should also know that this is a long road trip and the total distance from Guwahati to Tawang is around 510km and can't be covered at a stretch. So, you have to make one or two night halts before reaching the final place. Begin your long journey from the largest city of Assam, Guwahati. Hire a taxi or car to carry on this trip. You have to arrive to Guwahati a day before because you have to start early in the morning. The first destination of this exciting road trip from Guwahati to Tawang is Tezpur! The road route is through AH1 and NH37 to reach Tezpur. It is an ancient city with a number of attractions: Agnigarh, Cole Park, Bhairabi Temple, Da Parbatia, Christian Cemetery, Bamuni Hills, etc. You should halt for the day and make sure you get enough rest as the next journey is a long one. Better leave Tezpur very early and drive towards Bhalukpong (Arunachal Pradesh). It will take around 2 hours to reach here. Bhalukpong is a small town where they check ILP (Inner Line Permit). The scenic vistas of Arunachal begins from here. Bomdila is a picturesque place with a number tourist attractions. To reach Bomdila, take Bhalukpong road and then NH 229.However, you can only make time for one prominent place. Try to visit the Monastery or Eaglenest Wildlife Sanctuary (cover both if time permits). Halt in Bomdila and the next day go to Dirang! Start the tour as early as possible and head towards Dirang Valley. The sight of lofty hills and valleys will make you keep engaged along the trip. This route from Bomdila to Dirang and Dirang to Tawang is a tedious drive. The beauty of Tawang has made it one of the emerging destinations. The colourful Tawang Monastery, Gorichen Peak and Nuranang Waterfalls are some of the tourist places in Tawang. You can stay here for a day or two and return back to Guwahati. Here also tourists can travel in the local cabs or taxis. Here is the complete route map of the road trip from Guwahati to Tawang. All tourists should have Inner Line Permits (ILP) or Protected Area Permit (PAP) to enter Arunachal Pradesh. Indian travellers should have ILP and foreigners should have PAP. ILPs are available in the offices of Delhi, Kolkata, Guwahati, Shillong, Tezpur, Dibrugarh, Lakshmipur and Jorhat. Most importantly, it is for the people who like adventure and are fit to travel long distances. However, the beautiful scenery on the way and the untouched tourist places in Tawang will make you forget the strain. It is one of the travel plans which gives you an opportunity to totally getaway from the city atmosphere. 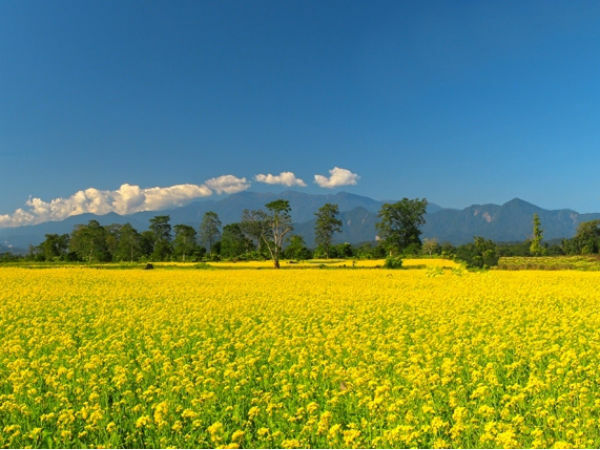 You'll enjoy the untouched nature at Arunachal Pradesh.